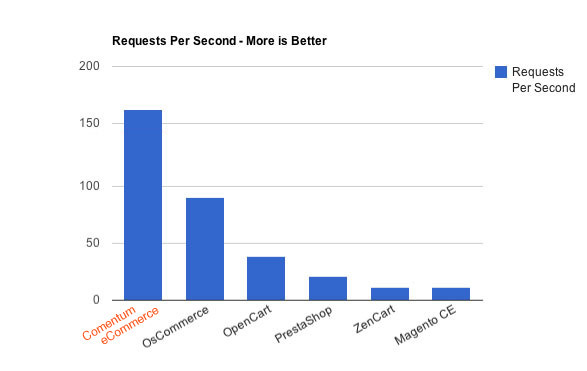 A comparison of Magento, OScommerce, Zen Cart, Comentum eCommerce and how they rank with Security, Performance, Reliability, Cost, Scalability and Support. This article is written to inform end-users and businesses about selecting the right eCommerce software for their business. Selecting an eCommerce software can be a challenging task; there are a lot of options out there, but there are no real resources available that help you select the best shopping cart software for your needs. I'll start out by going over the most important elements that any eCommerce software should have in order to be successful. Better performance correlate with better user and shopping experience. Google ranks site with better performance much higher. Security should be the most important consideration for any eCommerce website. Today, many merchant account services are now requiring sites to become and remain PCI compliant. If your eCommerce site does not follow the security protocals to keep your customer's credit card information secure or does not become PCI DSS compliant, and there is a breach of customers' credit card information, your business may be fined and sued. Magento, OSCommerce and Zen Cart's source code are available for download to everyone. This makes it easy for hackers to analyse the code and take advantage of any security holes that they can find. Comentum's eCommerce source code is not available for download for anyone, so the hackers do not know what is in and behind Comentum's ecommerce's source code. Additionally, Magento, OSCommerce and Zen Cart's provide add-on third party plug-ins / modules for features that are not available by their core functionality. Third party plug-ins tend to open security holes in the above open-source eCommerce platforms. SEO, SEF and SEM should be considred the most important and nessasary features of any shopping cart software. If your site does not have the optimum SEO, SEM and SEF implementation, it will not be able to complete in today's competitive market and will not be successful. Based on my 21+ years experience with eCommerce software, I rarely come across an eCommerce client who does not want to customize its shopping cart software to fit its unique business needs and also to set the site apart from the competitors. So being able to customize the look and feel and also features and functionality of an eCommerce site should be the major consideration for selecting a shopping cart software. OScommerce (and current stable version - 2.3.1 - as of this writing) is one of the older eCommerce softwares. OScommerce's code has been developed and kept up using the same legacy style code; this makes the code unmanagable and hard to customize. Zen Cart is an spin off of the OScommerce software. Therefore, Zen Cart's code is very similar to OScommerce, using same legacy style code, but with an added templeting system and some new functionality. Zen Cart has an added advantage over OScommerce which is its template system — This provides a capability for a site owner to select a custom template. Magento is written using a newer based PHP platform (Zend Framework), but it is developed using a heavily layered, complicated and intertwined coding style. This makes Magento one of the most complex softwares to learn, manage, and maintain. It has the lengthiest learning curve of any eCommerce software. Magento is bloated, using hundreds of unnecessary tables and hundreds of thousands of lines of codes to cover features that fit any customer. By making a shopping cart good for everyone, it becomes not as good for anyone. Unwanted features get in your way and it is not easy to remove them. And modules are intertwined which makes customizations more tedious and time-consuming. For example, to add an additional address input field to the checkout page, you would need to extend the Customer Address object (extend the entire object of customer address), change several template files and so on. This simple task will take 1-2 hours using Magento, but will take 5 minutes using Comentum's eCommerce. Comentum eCommerce is written using the newest, straight-forward PHP MVC platform. It is modular based, which makes adding or customizing features very easy. Comentum eCommerce is built with design and brand customizations in mind. It is built to make it easy to customize the look and feel by any designer without having to know any programming. Magento trys to cover every feature under the sun and even features that are rarely used by most online stores. Because of that, it uses hundreds of unnecessary tables and hundreds of thousands of lines of code which makes Magento bloated and slow. Sites that are running Magento with high numbers of products for sale will need to run on dedicated servers with a hugh amount of CPU power. OScommerce and Zen Cart both added features that require multiple database queries per page to facilitate features such as Best Selling, Up-sells in the Shopping Cart, and Customers Who Bought This Product Also Bought features. These features are added to a legacy code which slows the shopping cart noticibably when there are a high number of products. Comentum eCommerce is writtem using the latest PHP and MySQL platform, MySQL, code optimizations and database caching for optimum performance. There is a high demand for quality and experienced development firms. Finding an experienced development firm that can act as a partner in providing continuous support for your organization is essential in running a successful eCommerce site. Comentum has been in business for 21+ years and will provide enterprise level support and maintenance for its shopping cart client. Comentum eCommerce is writtem using the latest PHP and MySQL MVC platform which makes the maintenace and customizations easy by any development firms. Comentum eCommerce is lisenced so the site owner can take the application to any other developer for support and maintanance. This provides the full flexibility and offers piece of mind that the cart can ne maintained and scaled by any other development firm or an in-house team of programmers. Setting up an automated back up of the website and database should be an important part of maintaining any eCommerce site. Especially because today's hard drives are becoming less and less reliable and usually crash within one year. Magento and Comentum eCommerce provide a backup and export solution. OScommerce and Zen Cart do not provide a backup solution but can be accomplished through an add-on or a server backup solution. Due to the complex nature of Magento, maintaining and customizing a Magento shoppoing cart can be tedeous, time-consuming and expensive. Due to the legacy style coding of OScommerce and Zen Cart, maintaining and customizing both shoppoing carts can be tedeous, time-consuming and expensive. Comentum eCommerce uses a straight-forward, modern style, structured (MVC), PHP platform, which makes maintaining and managing a Comentum eCommerce site effortless cost saving and fast. Magento, OScommerce, Zen Cart and Comentum eCommerce are all developed and run on the popular open source LAMP platform (Linux, Apache, MySQL, PHP). Using Open Source platforms provides greater support resources and is the most cost-effective situation. Research for this article was completed February 1, 2010; pricing and other information may change.